Ever feel like everyone around you is more creative than you are? I’m constantly in awe of crafty creative types and am continually blown away that even in the midst of innovation overload (ahem, Pinterest), people maintain steady inspiration and come up with rousing new ideas for foods, crafts, clothes, hairstyles, games and plot-lines. I guess that means that there really is hope for those of us aspiring creative types. I mean, using a broom to paint your walls? Seriously, who thought of this insanity?! Well, I can now claim to have gone crazy/created something unique – drawn from a map. Few straight lines. Different clones that change mid-row. 28 blocks where there normally would be 4 or 5. 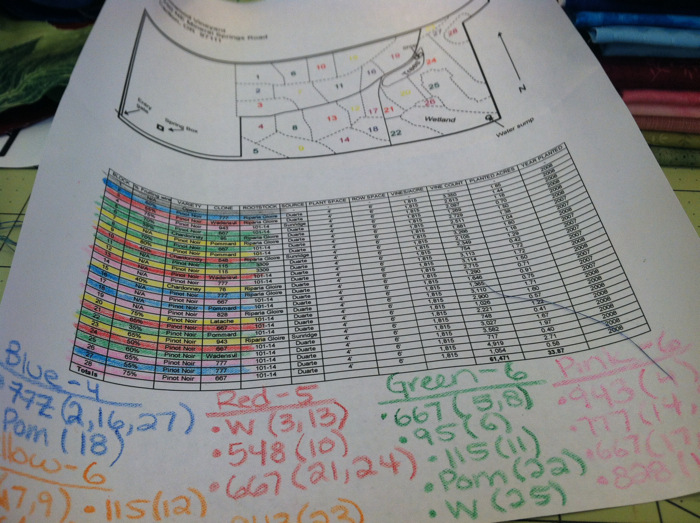 And, it was COLOR CODED! 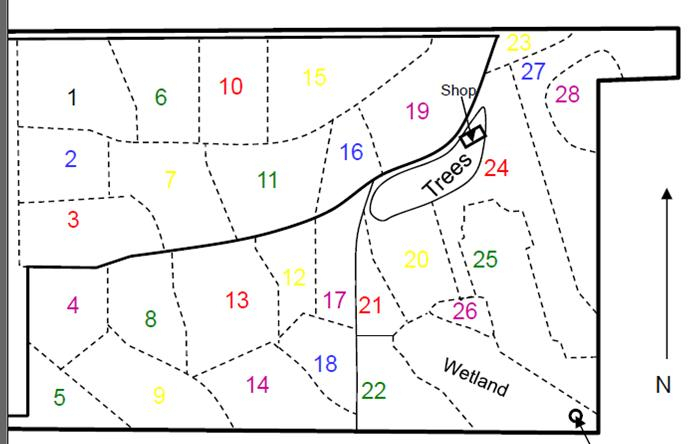 Even the colors on the map match the posts in the vineyard – so that the crew can figure out which block they’re in at any given time. 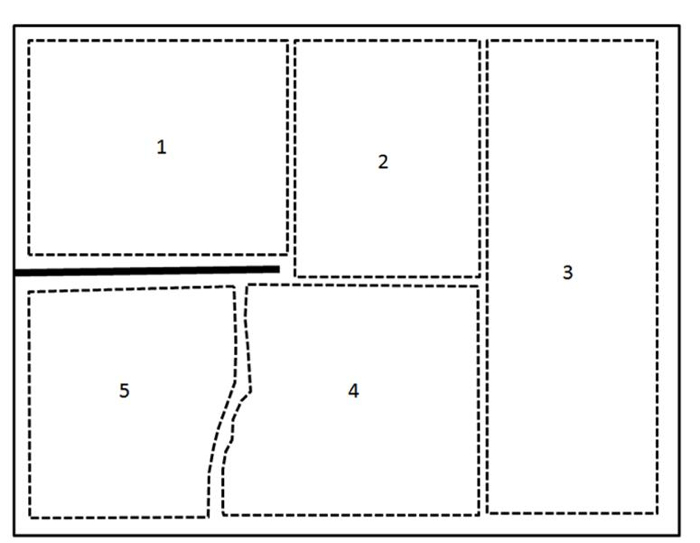 My first impression: that would make a great quilt! 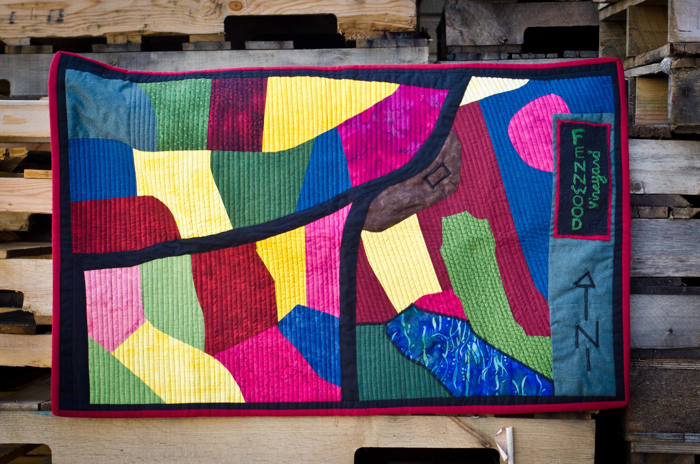 So… I went crazy and thought, yeah – I’ll make a quilt out of that! That’s what I did. I calculated the scale I wanted and printed out a map big enough. Then I cut out the blocks individually. 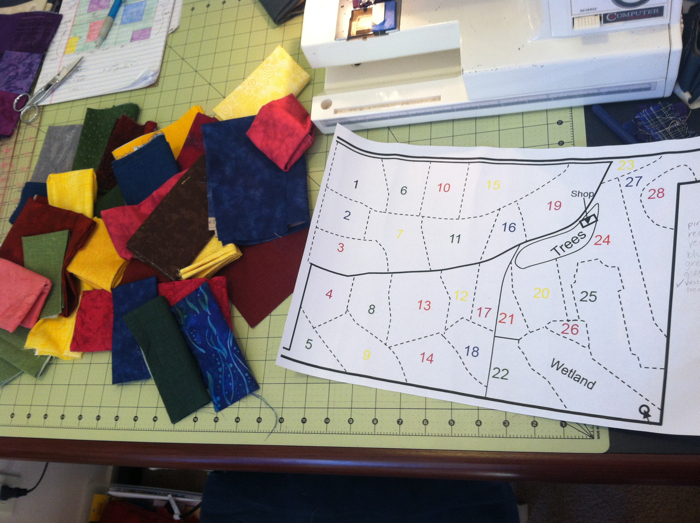 I picked fabrics to match the different clone combinations – if two blocks were color coded yellow, but were different clones, they got different patterns of yellow fabric. If two blocks were color coded red and had the same clones, they got the same patterns of red. Oh, yeah. I’m insane like that. And then I forgot to take pictures of the next steps…. But, take my word for it. It involved a lot of fussy cutting, sewing, unsewing, resewing, careful positioning, and more sewing. 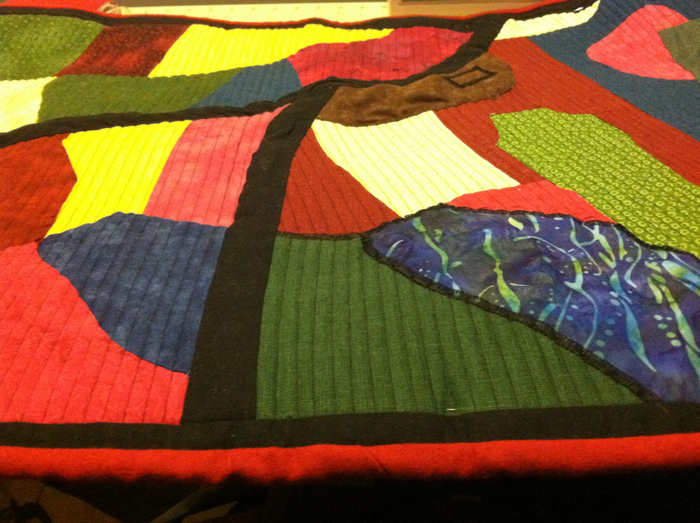 Once the top was complete, I sandwiched it and pin basted, then began my quilting. 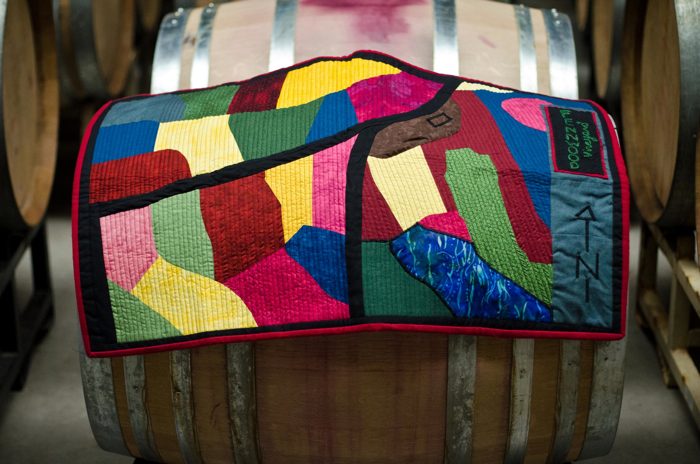 Of course, one’s only option in such a quilt is to quilt in the vineyard row orientation to mimic the aerial view of the vineyard – So. Yeah. If you ever feel like you’re the only loner in a sea of creative types, my advice to you is this: laugh. Because you’re talking crazy talk. Everyone is creative. Some of us express it through fabric, others through food, others through the spoken word, and others through code. Everyone has talents – you just have to learn how to express them. After all, someone needs to come up with the crazy idea to use a broom to paint their walls. *Grapes used for winemaking have come from a long line of laziness… The vines in Oregon come from a specific single species of grape – Vitis vinifera. There is a great deal of genetic variation within this one species so over many hundreds of years people have selected for specific characteristics and once they found the combination they liked, propagation takes place by taking cuttings from that plant, or cloning – creating identical descendants. Obviously, clonal work continues to this day (intentional pursuit of new mutations – and those that take place by accident). 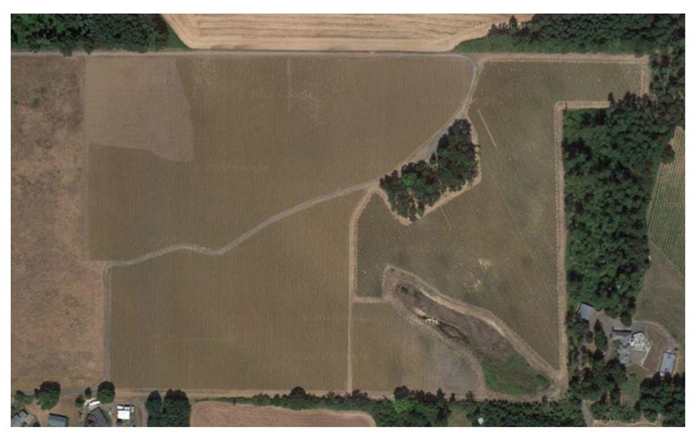 But, many of the grapes we grow in the Willamette Valley come from a handful of clones that were created long, long ago.